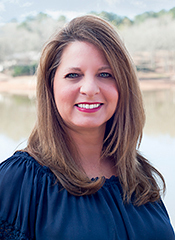 Wedowee Realtor Lesia Waldrep is a RE/Max Lakefront real estate agent, offering personal and attentive service. Her work is rooted in strong Christian values, southern hospitality, and a passion for the blossoming Lake Wedowee area. Here you will find a comprehensive online resource for Lake Wedowee real estate, including search functionality for multiple listings of Lake Wedowee homes for sale and Lake Wedowee lots for sale. Search properties available throughout a variety of Lake Wedowee Communities, such as beautiful Wright Way Estates, secluded Pineywoods, newly-developed Sweetwater, or Lake Wedowee’s premiere luxury community, Hunter Bend. As a Wedowee native, Lesia Waldrep brings an unmatched knowledge and zeal for life on Lake Wedowee and in the surrounding area. She finds joy in hearing about your unique desires and then connecting you with a home or property to suit your specific interests. This website is meant to ease and expedite your search for the perfect Lake Wedowee home or Lake Wedowee lot for sale. You may browse listings for Lake Wedowee homes for sale in the “Property Search” tab in the menu above. If you prefer a specific location, you can search the map. To narrow home listings by feature, use the advanced search option to filter Lake Wedowee property listings to your needs or priorities. When you are ready, connect with Lesia Waldrep through the “Contact” tab. She will respond quickly to discuss details and schedule a showing!